Main engine lubricating oil system – This system supplies lubricating oil to the engine bearings, and cooling oil to the pistons. Lubricating oil is pumped from ME LO Circulating Tank, placed in the double bottom beneath the engine, by means of the ME LO Pump, to the ME LO Cooler, a thermostatic valve, and through a full-flow filter, to the engine, where it is distributed to the various branch pipes. Pumps and fine filters are arranged in duplicate, with one as a standby. From the engine, the oil collects in the oil pan, from where it is drained to the ME LO Circulating Tank for reuse. A centrifuge is arranged for cleaning the lubricating oil in the system and the clean oil can be provided from a storage tank. Lubricating oil system: Lubricating oil for an engine is stored in the bottom of the crankcase, known as the sump, or in a drain tank located beneath the engine . The oil is drawn from this tank through a strainer, one of a pair of pumps, into one of a pair of fine filters. It is then passed through a cooler before entering the engine and being distributed to the various branch pipes. The branch pipe for a particular cylinder may feed the main bearing, for instance. Some of this oil will pass along a drilled passage in the crankshaft to the bottom end bearing and then up a drilled passage in the connecting rod to the gudgeon pin or crosshead bearing. An alarm at the end of the distribution pipe ensures that adequate pressure is maintained by the pump. Pumps and fine filters are arranged in duplicate with one as standby. The fine filters will be arranged so that one can be cleaned while the other is operating. After use in the engine the lubricating oil drains back to the sump or drain tank for re-use. A level gauge gives a local read-out of the drain tank contents. A centrifuge is arranged for cleaning the lubricating oil in the system and clean oil can be provided from a storage tank. The oil cooler is circulated by sea water, which is at a lower pressure than the oil. As a result any leak in the cooler will mean a loss of oil and not contamination of the oil by sea water. Where the engine has oil-cooled pistons they will be supplied from the lubricating oil system, possibly at a higher pressure produced by booster pumps, e.g. Sulzer RTA engine. An appropriate type of lubricating oil must be used for oil-lubricated pistons in order to avoid carbon deposits on the hotter parts of the system. Cylinder oil is pumped from Cylinder Oil Storage Tank to the Cylinder Oil Service Tank, placed min. 3000mm above the cylinder lubricators. The cylinder lubricators are mounted on the roller guide housing, and are interconnected with drive shafts. Each cylinder liner has a number of lubricating orifices, through which the cylinder oil is introduced into the cylinders via non-return valves. Large slow-speed diesei engines are provided with a separate lubrication system for the cylinder liners. Oil is injected between the liner and the piston by mechanical lubricators which supply their individual cylinder, A special type of oil is used which is not recovered. As well as lubricating, it assists in forming a gas seal and contains additives which clean the cylinder liner. The level of lubricating oil indicated in the sump when the main engine is running must be sufficient to prevent vortexing and ingress of air which can lead to bearing damage. The sump level is to be according to manufacturers/shipbuilders instructions . The ‘Sump Quantity’ is always maintained at the same safe operating level and is given in litres. It is essential that the figures are mathematically steady and correct from month-to-month, taking into account consumption, losses and refills and reported . 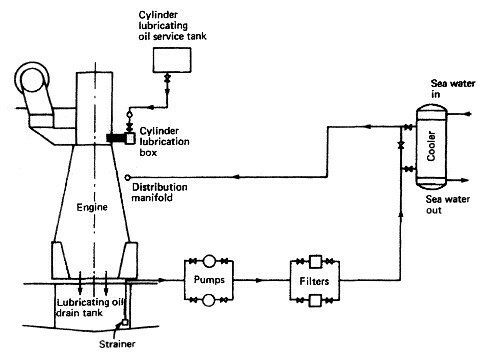 The ‘Sump Quantity’ is calculated with the engine stopped, but the lubricating oil pump in operation, thus keeping the system oil in circulation. Sufficient reserve quantities of lubricating oil must always be held, i.e. to completely fill the main sump and sufficient quantities of other lubes must be held to cover the intended voyage plus 20%. Lubricating oils are a major expenditure item, therefore, all purchasing must be pre-planned with the aim of buying the maximum amounts from the cheapest supply sources which are primarily the US, Europe and Singapore. Lub oil requisitions should be sent to the office at least 10 days before the intended port of purchase and clearly indicate if the vessel requires supply in bulk or in drums. They provide an essential part of the lubrication system on many types of engine in particular auxiliary engines with engine driven lubricating oil pumps. They provide a supply of oil to the bearings prior to start up and limit the length of time that boundary lubrication exists, and shorten the time when hydrodynamic lubrication commences. They must be maintained and operated in accordance with the manufacturers’ instructions.